Suzanne Dean, creative director at Vintage, shares the creative process for designing the cover for Haruki Murakami’s latest novel. In Killing Commendatore by Haruki Murakami, a thirty-something portrait painter in Tokyo finds himself holed up in the mountain home of a famous artist, Tomohiko Amada. When he discovers a strange painting in the attic, he unintentionally opens a circle of mysterious circumstances. In the novel, a well in the woods becomes the focal point of all the mysterious events in the book. 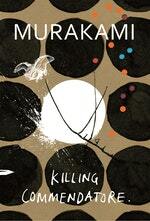 Holes or circles are an essential and recurrent theme, which happily coheres perfectly with the branding that I have used throughout Murakami’s other cover designs. I tried a whole series of iterations on this theme, but finally settled on using painted circles on the cover, the boards, and the endpapers. In the book these holes serve as symbols for a place where one can slip between worlds, and I wanted to represent this through the scattering of these circles. The tiny die-cut holes on the jacket allow you to see through to the circles printed on the hardback’s cover. The book’s narrator – the artist – had spent time at art school, painting mostly abstracts, but then moved on to become a professional portrait painter. I developed a series of painterly circles to suggest the artist’s abstract work, while at the same time referring back to the theme of holes. In the story, the narrator takes up residence in a house where a famous painter of nihonga (Japanese-style paintings) previously lived for decades. Upon moving into this house, the artist is inspired to work on abstract artwork again – but his plans don’t go well. Lying in bed at night, he hears a strange scraping sound coming from above. In his spare room, he finds a horned owl and a canvas carefully wrapped in brown paper, with the words Killing Commendatore written on it. The brown paper was inspiration for the background of the cover design. I commissioned Vladimir Zimokov to create the linocut of the owl and sword. Described as a beautiful animal, like a ‘cat with wings’, for me, the horned owl serves as a symbol of nature as something beyond our control, and also of the joy of connection with others — the narrator soon relishes sharing the house with the owl. The Commendatore stands for the idea in the novel. He is represented on the cover by his sword, which pierces a circle. I also wanted the sword to represent the violent undertones running throughout the book. 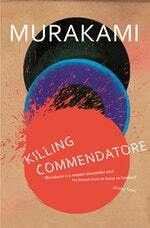 Typically Murakami, this novel is very playful. There is a scene where a character called Long Face appears through a square-shaped hole, which leads down to a Metaphor Path. Here the narrator must watch out for ‘double metaphors.’ And, in a very Alice in Wonderland-like moment, the narrator has to overcome his claustrophobia to squeeze himself through a tiny hole which is again represented by the tiny die-cut holes on the cover. These tiny holes reveal the colour circles on the hardback cover, which I subsequently painted to resemble an artist’s paint palette – allowing me to introduce more circular motifs. The endpapers feature a series of sketches and workings from this cover design process, which deliberately alludes to the thinking processes of an artist, like in the book.